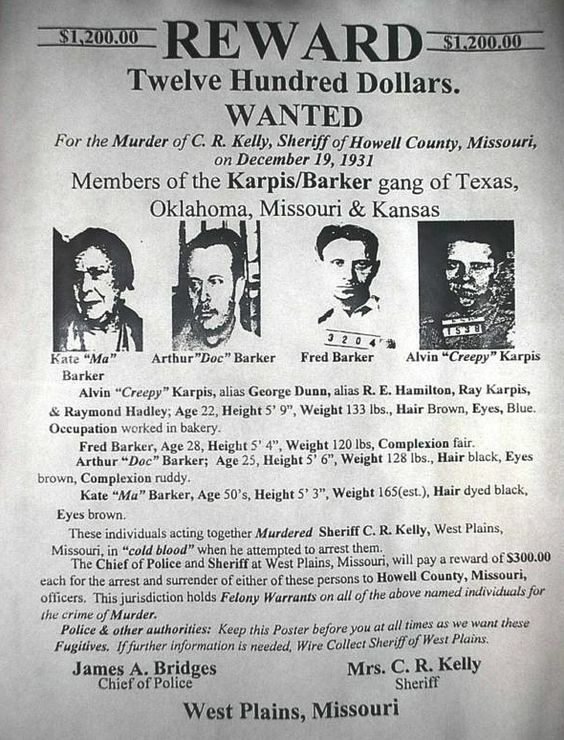 Arthur R. “Doc” Barker was a member of the Barker-Karpis Gang, which was one of the longest-lived criminal gangs during the Depression Era. Arthur was born in Aurora, Missouri on June 4, 1899, the third son born of George E. and Kate “Ma” Barker. By the 1920s he, along with his brother Fred, and Alvin Karpis started to commit crimes such as theft and robbery. On July 18, 1918, Barker was arrested for stealing a car and was sentenced to prison in Joplin, Missouri. On February 19, 1920, he escaped from prison and began to commit armed robberies and murdered two people. On August 25, 1921, Barker and three other men robbed a woman at a hospital construction site in Tulsa, Oklahoma. Seen by a night watchman named Thomas Sherill, a gunfight broke out and Sherill was shot and killed. 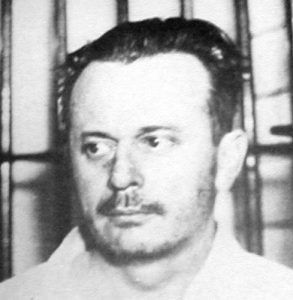 Barkers was later arrested, convicted of murder and sentenced to a life at the Oklahoma State Penitentiary. However, he was paroled ten years later in September 1932. He then returned to the gang and on December 16, 1932, participated in the robbery of the Third Northwestern Bank in Minneapolis, Minnesota, in which two policemen and a civilian were killed. On August 30, 1933, the Barker-Karpis Gang robbed a payroll at Stockyards National Bank of South St. Paul, Minnesota, in which Barker shot and killed a policeman after he had already surrendered. In June 1933, the gang kidnapped William Hamm, a wealthy St. Paul, Minnesota man. After receiving a $100,000, they released him. They then kidnapped Edward Bremer, another wealthy St. Paul, Minnesota man in January 1934. This time they asked for and received a $200,000 ransom and released Bremer in February. 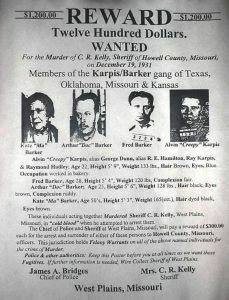 On January 16, 1935, Fred and Ma Barker were killed by the police and a year later Arthur Barker and Alvin Karpis were captured. Barker was sentenced to life in prison and was first sent to the Leavenworth Federal Penitentiary in Kansas. Later he was sent to the Alcatraz Federal Penitentiary in San Francisco, California. On the night of January 13, 1939, Arthur Barker, along with Henri Young and Rufus McCain, attempted to escape from Alcatraz. Their plans failed and Barker was shot and killed by guards. Young and McCain were recaptured and sent to solitary confinement.